This item fits Yamaha ATV Raptor 660 2001~2003. 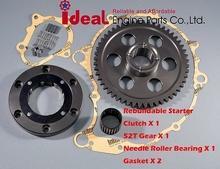 Product contains OEM Type starter clutch, gear Key Feature 1. Full line one way starter clutch for ATV, Scooter and motorcycle. 2. High-Mix Low-Volume manufacturing for Aftermarket products. 3. Rich OEM experience. 4. Affordable and Reliable Taiwan Performance Products. 5. For some models we can provide Life-Time Warranty service 6. Unique selling point for our customers. 7. Private label packing service. Suzuki Eiger 400 LTA LTF400 one way bearing starter clutch gear 2002~2012 Shipping: All items are shipped by Express Mail Service Next day shipping after confirmation of payment To US and Europe: 95% of our customers receive product within 5 working days Shipping may vary due to peak period or Cusoms check Key Feature: 1. Full line one way starter clutch for ATV, Scooter and motorcycle. 2. High-Mix Low-Volume manufacturing for Aftermarket products. 3. Rich OEM experience. 4. Affordable and Reliable Taiwan Performance Products. 5. For some models we can provide Life-Time Warranty service 6. Unique selling point for our customers. 7. Private label packing service.